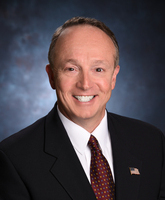 Lawrence “Larry” Leitch has one goal: to support you in pursuing your financial goals. He provides you with the guidance and expertise, while using the best available technology, to be both informed for and responsive to you. He and his partner, Steve Spurrier, colleagues since 1990, started Synergy Financial Group in 2004 to provide clients with a wide array of financial services using greater technical resources for their firm and their clients’ benefit. Leitch and his staff provide comprehensive financial services to a wide range of clients, including businesses and individuals seeking all levels of financial planning. The Synergy Financial Group team uses many high-tech research tools to tailor offerings to address specific needs for a wide range of clients. Synergy Financial Group clients enjoy online access to their accounts. The greater reliance on highly secure, web-based resources enables them to provide greater speed and flexibility to address their clients’ needs. Clients also have access to free company e-newsletters, important financial updates, and links to useful services and resources. A lifelong Baltimore resident, Larry started as a stockbroker since 1987. One year later, he took a position with Prudential Life Insurance Co. From December 1988 to April 2005, he worked as a financial planner at First Financial Group in Towson, Maryland, where he led the Group Benefits Department (2001) and led the Pension Department (2002) in sales. He serviced more than 250 clients while working at First Financial. Leitch earned his Certified Life Underwriter (CLU®) designation in 1993, his Chartered Financial Consultant (ChFC®) designation in 1996, and his Registered Employee Benefits Consultant (REBC®) designation in 2010. Most recently he has qualified for and added the Accredited Investment Fiduciary (AIF®) designation in 2012. Leitch graduated from Indiana University of Pennsylvania in 1986 with a B.S. in Finance, and Accounting and Economics minors. A rugby player for his college, Leitch paid his own way through college. He is a 1982 graduate of Calvert Hall College High School in Towson, Maryland. If you are a user of LinkedIn and Facebook, you can find more information about Leitch’s profile on his LinkedIn page by visiting www.LinkedIn.com or his Facebook page by visiting www.facebook.com. You can also follow SFG’s Twitter here, Facebook here, and Company LinkedIn page here. He is married to Joyce, and they have three children, Olivia, and twins, Jack and Abby. Leitch is a registered representative and principal with securities offered through LPL Financial, member FINRA/SIPC. He is also a investment advisor representative for advisory and financial planning services through Synergy Financial Group, a registered investment advisor.